Insight Civil utilizes a holistic and comprehensive approach to land and site development. Working closely with the Planning + Urban Design group, the Civil Engineering group provides sustainable, resilient and cost-effective site development solutions to address a full spectrum of development challenges. Our engineers have extensive experience with site development projects of various scope and scale: from small-medium sized residential developments in coastal neighborhoods, to large institutional properties located in a floodplain, to waterfront or transportation infrastructure, our team excels in handling a diverse pipeline of projects. The Civil Engineering group understands how to manage and deliver a project from its inception through construction completion and project closeout. The collective experience of our engineers involves work on a variety of significant, high-visibility projects including the JFK Airtrain, the East Side Access project, the launch and expansion of the NYC Ferry system, redesign and development of the Coney Island Hospital campus, and structural restoration of Pier 40 in the Hudson River. Waterfront sites, port and marine infrastructure carry a unique set of challenges due to a constantly changing coastal environment. At present, more than one billion people worldwide live at or in the vicinity of the waterfront. Engineers at Insight Civil have specialized expertise in upland civil and waterfront design. Our civil engineers are committed to an integrated approach to waterfront infrastructure design that centers on balancing ecology, standard of care, access and resiliency. Engineers at Insight Civil are familiar with industry best practices in sustainable and resilient infrastructure design. 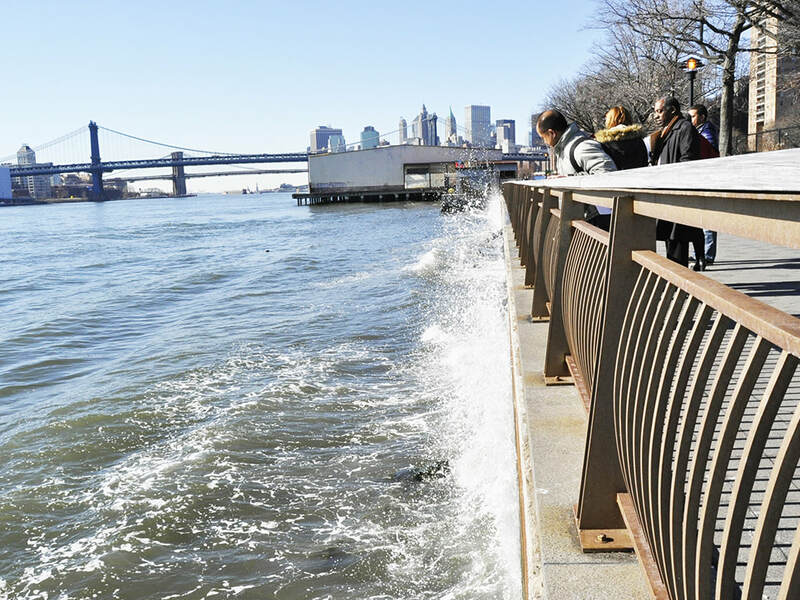 Rating systems, such as the Envision system from the Institute of Sustainable Infrastructure (ISI), or the WEDG guidelines developed by the Waterfront Alliance in NYC, are key examples of excellent design guidance for future waterfront and coastal development. Our engineers have successfully navigated the complexities associated with design, development and construction of waterfront sites. From best practices in low-impact design for roadways and parking facilities, to more sustainable and context sensitive solutions, our engineering group understands that how we design matters, both now and for future generations. In densely developed, as well as newly urbanizing areas, the need for professionals experienced in design of traffic conveyance systems and roadway improvements is imperative. Transportation expertise at Insight Civil includes conceptual and final design plans for street improvement plans, traffic impact mitigation studies, construction phasing, and public agency coordination. Our Engineers are also skilled users of AutoTurn swept path analysis software and ParkCAD for parking lot design and layout. As traffic and roadway infrastructure constructed in the mid-20th century is nearing the end of its useful life, it is more important than ever that we engineer our most critical infrastructure to function soundly and sustainably for decades to come. We believe in imagining the future, as we develop designs for today. Limited water supplies, aging infrastructure, funding constraints and the needs of rapid population growth have placed high demands on our water and wastewater collection systems. Our holistic approach to design for water resources focuses on developing locally-attuned, adaptable, efficient and sustainable systems that can be integrated seamlessly to the project site and/or as part of a larger system. Insight Civil engineers strive to provide clients with access to cutting edge industry knowledge, as well as recommendations informed by practical experience with implementation of customized integrated water resource management solutions. Our team has provided designs for storm drains, detention basins, recharge basins, domestic and reclaimed water lines, hydrology and hydraulic studies, water reuse and on-site treatment systems, green infrastructure, swales, construction BMPs and compliance with NPDES requirements by working closely with our urban planners and sustainability experts.